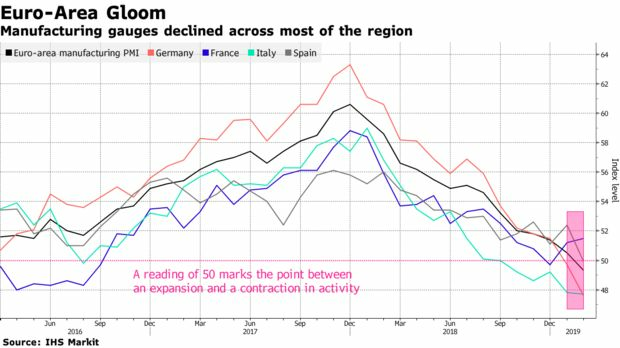 Euro-area factories suffered their biggest drop in orders in almost six years in February amid mounting concern over trade tariffs and Brexit, dealing a blow to those anticipating a speedy rebound in momentum. Led by Germany and Italy, manufacturing output in the 19-nation region contracted last month, with a Purchasing Managers’ Index falling to 49.3. Companies continued to report spare capacity and inflation pressures eased to levels last seen in late 2016. The downbeat report from a key sector of the euro-area economy comes less than a week before European Central Bank policy makers meet to decide whether the region could use another stimulus boost. So far, officials have argued the bloc will emerge from its current soft patch in the second half, but sluggish demand raises questions over the outlook. The ECB is currently updating its projections for growth and inflation through 2021. While factories continued to create new jobs in February they “are likely to take a more cautious approach to hiring and investment, and instead focus on cost control,” Williamson said.